Ken studied music at NYC’s High School of Performing Arts (Yep….the “Fame” school) and later studied business Admin at Wagner College in Staten Island, NY. 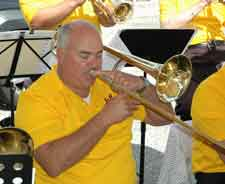 He studied Trombone under Donald Wittekind and Jimmy Knepper. Ken plays regularly with The Full Count Big Band and subs with Brookdale Big Band, Lakewood Jazz Ensemble, Bootcamp Big Band and the Swingtones. He has appeared with the McDonald’s Tri-State Jazz Ensemble on the Merv Griffin show and with the following artists: Buddy Rich, Mel Lewis, Peggy Lee, Dave Garibaldi, Bill Watrous, Connie Francis, Steve Turre, Butch Miles, Jon Faddis, Bobby Shew, Jeff Jarvis, Claudio Roditi and Wayne Bergeron.